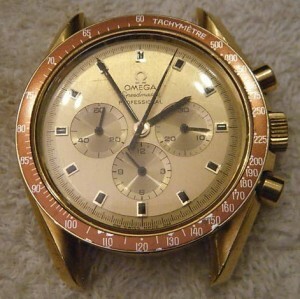 I happened to notice this Gold “Apollo” Omega Speedmaster for sale on eBay yesterday, an accident of sorts as they’re mostly outside my collecting pursuits, but I thought it interesting enough to note here. The seller apparently had owned several examples and is selling them to finance the construction of a custom sports car, recently selling one other example on eBay as well. The original examples of these 18k Gold BA 145.022 Speedmasters with the unique burgundy bezels and solid gold dials were presented to Astronauts, NASA officials, and select US government officials at a special gala dinner on November 25, 1969, as detailed by Brad “Watchcarefully” Jacobs in his Gold Apollo Speedmaster article originally published in International Wristwatch Magazine. 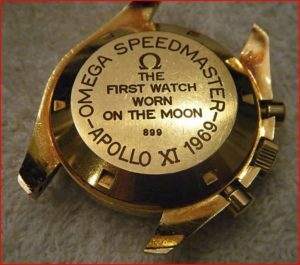 The watches are also discussed in the Omega Speedmaster Table originally created by Omega factory historian Marco Richon and formatted, appended and hosted by the late Chuck Maddox and further discussed in Chuck’s Guide to Speedmaster Moonwatch Casebacks. These are very seldom seen among collectors and are unusual for a number of reasons. Not only were they the first gold Speedmasters, but featured the unusual solid gold dial, burgundy bezel, and individually numbered casebacks (the first instance of such from the factory that I’m aware of). Decidedly few examples seem to have ever reached the collector market. Subsequent gold Speedmaster models typically feature a more conventional black dial an bezel. The same seller recently completed another eBay auction for #197 which closed at $9,900. Only a few documented sequences like the lowest numbers 1-31 and a few other subsequent spans were actually presented to astronauts and NASA/government officials. As best I can determine both these eBay examples were part of the majority of the production series sold through open retail channels. And though I see no reason to suspect that the watch(es) or listings are anything less than legitimate, I claim no expertise with these and I would encourage potential bidders to conduct their own research before bidding.